HENDERSON, Nev. – As an architect who grew up in Las Vegas, going “home again” is a relative term. When Craig Galati heard the opportunity was available to upgrade and redesign the Garside Junior High School pool, it was better than going home – it took the architect back to junior high school. Galati, principal at LGA, attended the school, located at 300 S. Torrey Pines Drive, from 1972 to 1975. A member of Garside’s diving club, Galati spent a lot of time at the school’s pool as a kid. He and the LGA team had big ideas for the project once they were awarded the bid. The project is expected to be completed in time for this year’s swim season. The project was designed with additional shade, a beach-entry pool, a lap pool, play structure with large slide, and splash pool, complete with ichthyosaur, the state fossil of Nevada. The project also was designed to eventually accept solar thermal power. The theme of the project surrounds the role water played in the creation of the Las Vegas Valley. Dried up watering holes, a faded water line along the locker room building and the mosaic ichthyosaur in the splash pool are some of the educational elements, Galati said. To him, the project was created with equal parts nostalgia and LGA design expertise. On the city side, the project was led by Michael Viaovich, architectural project manager for the city of Las Vegas public works department, who also attended Garside Junior High School. 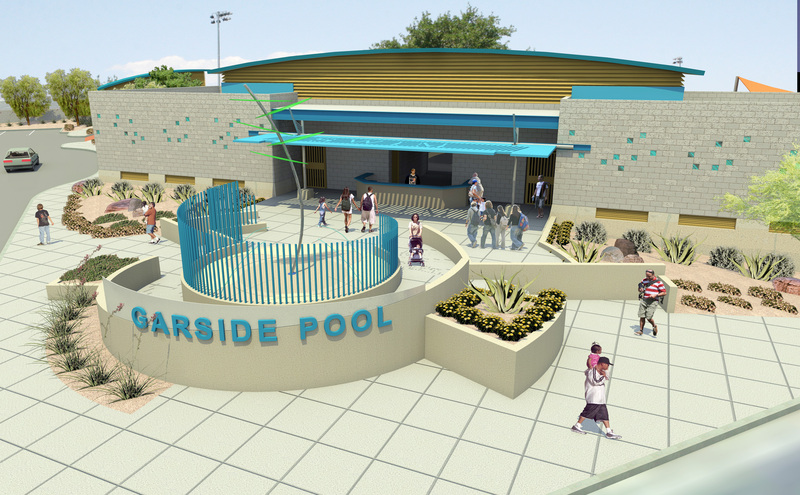 According to the city of Las Vegas, the Garside Junior High School pool was originally built in 1971, and the idea of upgrading the pool has been in the works for six years.